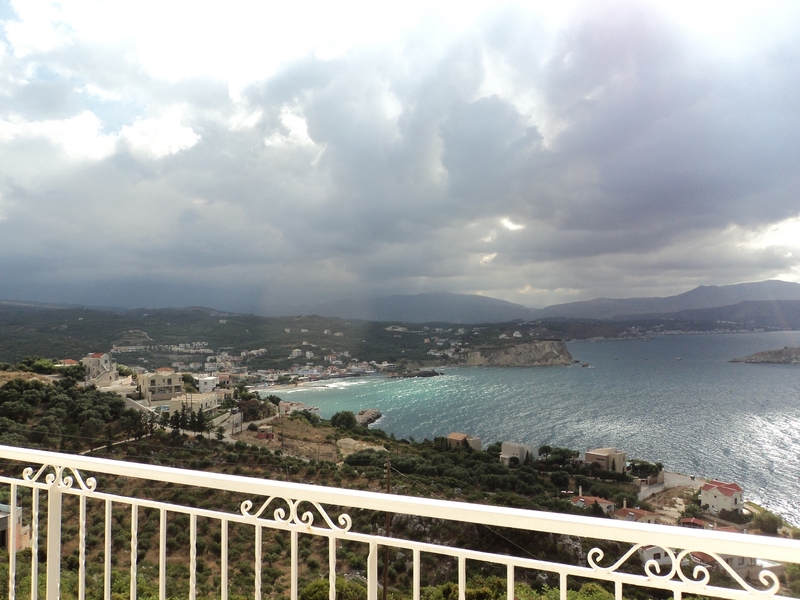 I am writing up this post on my wonderful balcony, on this cloudy day in November. We’ve just come out of a prolonged period of fine, sunny and warm weather and now we are getting rain and thunderstorms. But right now it is not raining and I can hear the sea and see the waves rolling onto the shoreline all around Almyrida Bay. Vasili’s sheep are in my garden below again and so I hear the tinkling of the ‘main’ sheep’s bell and the odd almost baby-sounding bleats coming from the little ones. They seem to lamb all year round on Crete. It must be our wonderful climate! View from my balcony on this cloudy day in November. It’s been many weeks since my last post and I am in the perfect place to reflect on the highlights of these past weeks. Well one of these highlights has to be my new car! I finally picked it up a couple of weeks ago – a Hyundai Atos and I love, love, love it! Even though it is another old car, it is in tip top condition, having had only one owner who really took care of it. My wonderful Greek friend Artemis found the car for me and helped me with all the bureaucratic paperwork that goes with buying a car here on Crete. He is also helping me with the sale of my Punto. Old cars hold their value here, particularly the Hyundai Atos – renowned for its reliability and longevity. It is much cheaper to run and being higher off the ground, is much more suited to the roads and tracks here. I hardly feel the bumps in this car! Finally.. the Atos is black and I have always looked good in black! Our girly night out before Lisa leaves for the UK. From left to right – Debbie, Lisa, myself and Kim. A few weeks ago I joined Lisa, Debbie and Kim for a girly night out at Totem in Plaka. My close friend Lisa has gone back to the UK for 6 months and we shall all miss her! 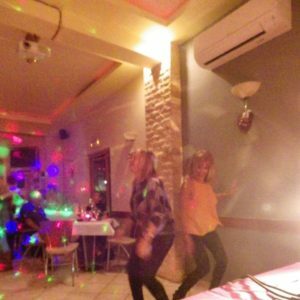 So we got together for ‘open mic’ night at Totem and a couple of days later we met up again on the far beach in Kalyves for a while – on the Saturday afternoon before Lisa was to leave on the Sunday. It was lovely to sit in the sand chatting, in the warmth of the October sun. About a week or so later, I got the chance to take my new car for a long drive when Debbie and I had a wonderful day of beachcombing at Falasarna. It was fabulous weather with no wind, making perfect conditions for beachcombing (Falasarna can get very windy indeed!) We covered two separate beaches along this breathtaking coastline, and filled our bags with gorgeous sea treasures! As is usual at this time of the year, I have been busy creating some of the seashell mosaic designs that sold well in the summer months. 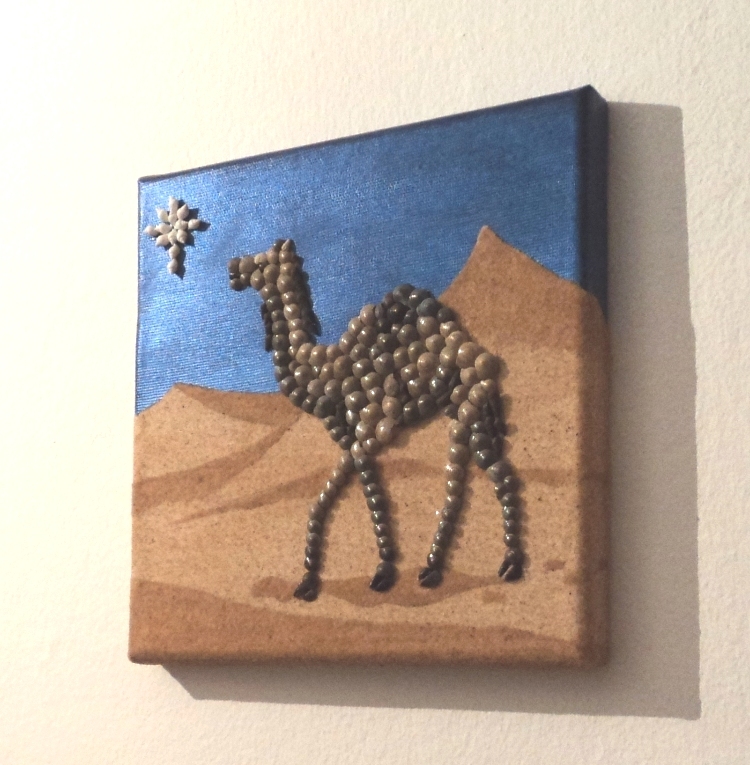 I also decided to create a small design for Christmas – My Christmas Camel! A little pun on words, but I think it is a really festive picture. Actually I made one of these a few years ago and sold it at the annual Almyrida Christmas Fayre. Since I stopped my beach selling I have made a few private sales. Amongst them are my good customer friends, Jonathan and Grete, who paid me a visit at home in order to purchase two artworks on behalf of their friends in Norway. Grete and Jonathan have a second home in Kefelas, spend a great deal of their time here on Crete and It is always a pleasure to see them! I have also acquired a few recent Etsy sales… cigar, cigar… as they say on Crete…slowly, slowly. The online shop is an on-going and long-term project and can be extremely frustrating! It doesn’t help that Etsy keep changing their SEO and algorithms which set you back each time. I never would have dreamed that it would be so difficult to get established online and only wish I had realized this at the beginning, instead of only taking steps to address the necessary work needed – over a year after I opened the shop!. Thank goodness for Stiliyana, who has been helping me since January. Birthday Cake! – courtesy of my friend Patrick. 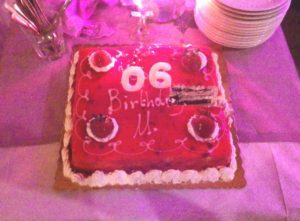 So this brings us to much more recent events, the biggest highlight of the past few weeks has to have been on November 8th – my 60th Birthday! I had already picked up all my post from the village square over the previous couple of weeks. So I had lovely cards to open from all my family before I’d even had breakfast! Then all day long I was receiving Skype calls from family. Emma Skyped me in the morning, with Ralph and Neve. Ralph was supposed to sing ‘Happy Birthday’ to me – but of course was too shy when it came down to it, bless him! Emma managed to make a recording and sent it to me soon after our Skype chat. Ralph’s 3rd Birthday is exactly a week after mine and we share the scorpio star sign. I also spoke to my Mum and my Sister Karen and Brother, Mark. Emails with Birthday wishes, texts and messages on Facebook (which I admit I barely have time to use) were coming in all day. It made me feel really special! Sotiris brings out the cake, with all 3 candles lit! 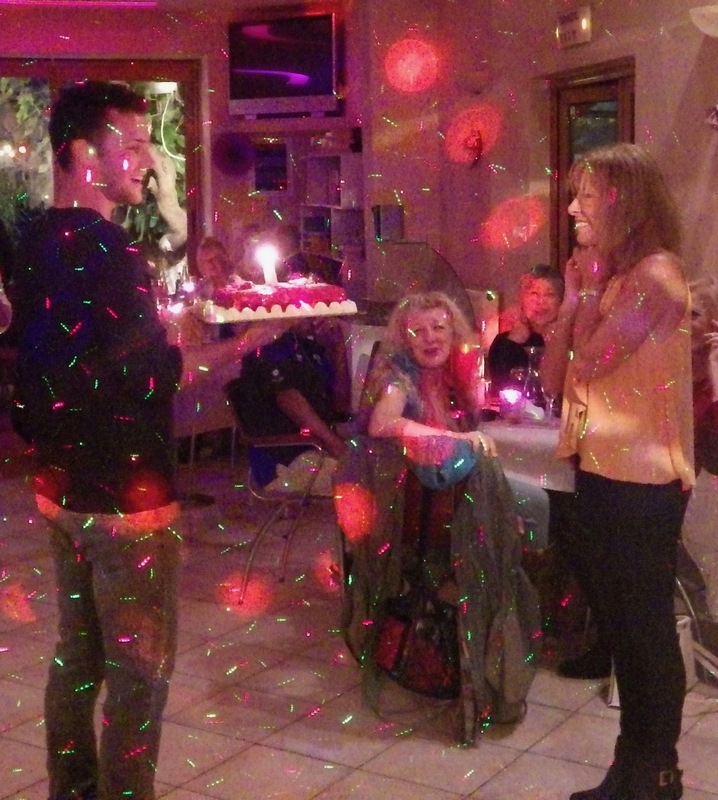 Then in the evening I had a big Birthday Party! I only decided to have this party two weeks before my birthday and it was my family who persuaded me to mark the occasion in some way, when I hadn’t really given it a thought! 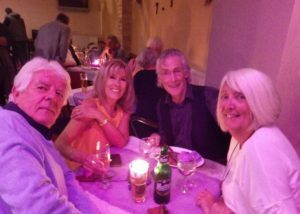 It was held at my local taverna, Vangeli’s in Plaka Square, who put on an amazing spread of traditional Greek food, amongst a variety of other dishes. Shanna had decorated Vangeli’s beautifully – understated but elegant (if you can be elegant in a Greek Taverna!) in a purple and silver theme and with purple scented candles on each table. My good friend, Ray was DJ for the evening and what a sterling job he did! Not only did he offer his services and equipment for free (there’s a joke in here somewhere?!) – as a birthday present – he played brilliant music all night and inspired almost everyone to get up and dance! Patrick kindly organized my large and scrumptious Birthday Cake and when Sotiris brought it out for me to blow out the candles (I think there were only about 3!) – I laughed because they had the numbers 06 on the top! 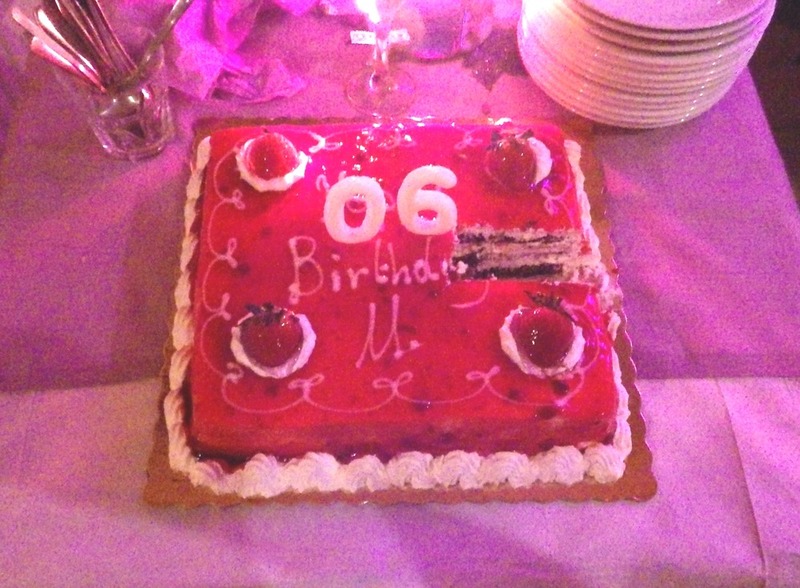 Sotiris said that it was because nobody could believe I was 60! My only regret is that I didn’t properly organize photos of the event. Even though I took my camera with me, I didn’t think to use it as I was too busy socializing! Thankfully, my Canadian friend, Bob was happy to take a few photos for me. Sadly, all the various lighting systems meant the photos were blurry and not as good as we’d hoped, but at least I have been able to show a few of them. I cannot believe the generosity of my friends here on Crete. They came to my party with such wonderful gifts, which I really wasn’t expecting and I was thoroughly spoilt! 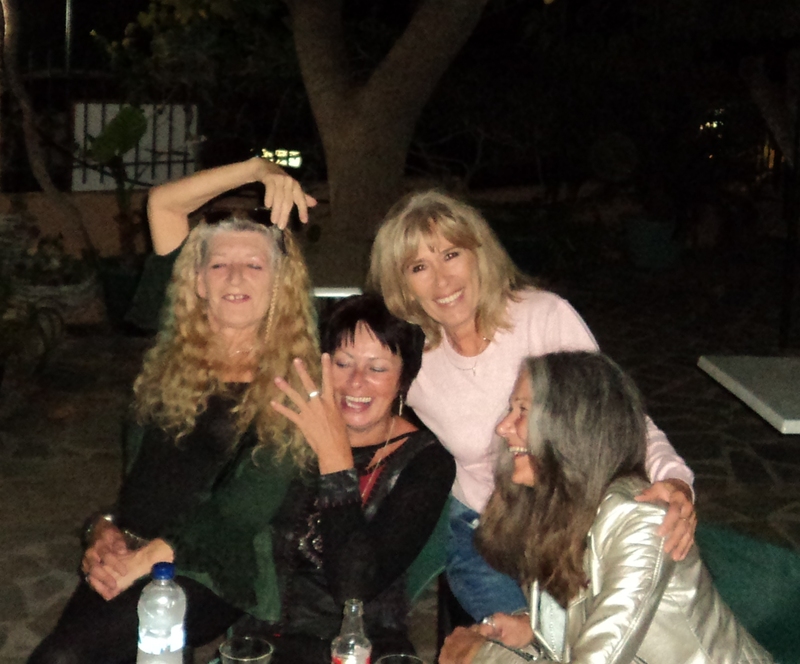 I am so lucky to have such lovely friends here on Crete. It was wonderful to see everyone together as I don’t see many of them on a regular basis. My long work hours keep me at home a lot, and creating more balance in my life is something I am still working on. But what a fabulous time I had – drinking copious amounts of Prosecco, enjoying fabulous food, chatting with lovely friends and loving lots of exhaustive dancing! It was a great party and I had a wonderful time! Jackie and I take a dance down memory lane and do ‘The Bump’!! This entry was posted in Blog Posts and tagged Almyrida, Plaka, Seashell Mosaic by micmaryjo. Bookmark the permalink. Belated Happy Birthday ! Your evening looked wonderful! Thank you Margaret, it was! I hope you are happy and well. Best wishes to you.